I startled awake from a dead sleep last Sunday afternoon, the word we all dread to hear vibrating through my every molecule. “Fire!” I heard it again, this time recognizing Chuck’s strained voice only a decibel below scream level. Sitting up and staring dumbly at my surroundings, I groggily realized I was in bed. Then it came back to me – I had been taking a much needed afternoon nap after getting 2 hours of sleep the night before and teaching 9 preschool classes within 3 hours that morning. Ugg. Talk about a lead weight in your head. What’s going on? I thought, still not quite awake. Then I smelled smoke. I jumped up and ran into the smoke-hazy den, where through the glass porch door, I could see Chuck throwing a bucket of water into the corner. The smoke alarm started screeching. I raced over to the metal porch door, but it was super-heated. Ouch! Peering through the window onto the porch, I saw glowing embers surrounding a blackened lump that used to be a large potted silk fern. Black soot left a smoke trail up the stucco wall and darkened the white metal ceiling. The floorboards were charred. 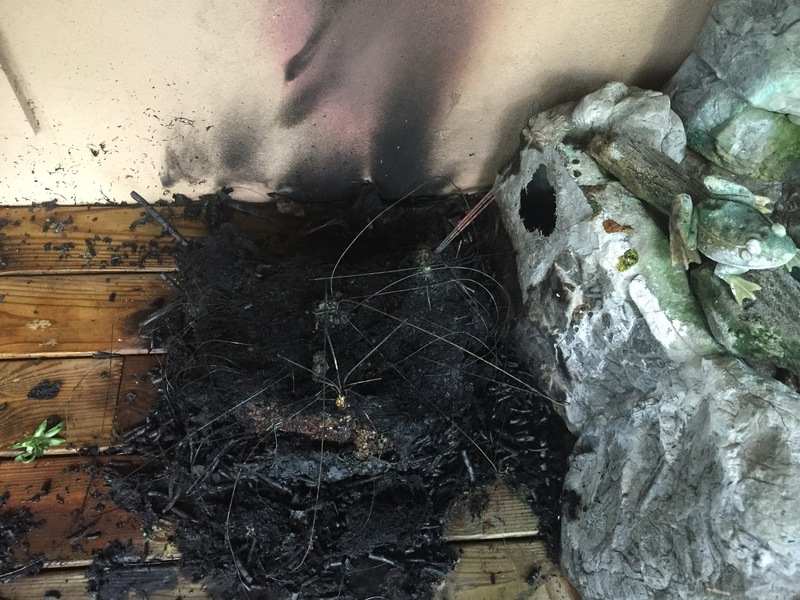 Chunks of smoldering fiberglass from the four-foot fountain in the corner – the one now sporting a gaping hole in its side – were scattered to the far end of the porch, 30 feet away. 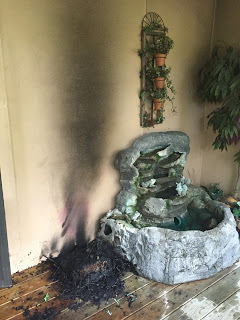 We still don’t know exactly what happened, but our best guess is that an electrical cord attached to the fountain pump shorted out and somehow caused the potted fern to explode, turning pieces of the fountain into flaming projectiles. By the grace of God (and that is NOT just a flippant expression here), Chuck was home (he usually goes outside to get exercise on Sunday afternoons at that time), sitting in a chair he rarely sits in about as close to the porch as you could get. He heard the explosion and thought it was a tree falling. (With all the rain we’ve been getting lately, huge oaks have been falling about every other week.) Then he noticed pretty good sized flames erupting through the glass porch door and started yelling while he ran to grab buckets of water so I would wake up and get the heck out before the house burned down. Long after Chuck had doused the fire, we were still trembling. What if we hadn’t been home when the fern exploded? Two hours earlier or two hours later we would have been gone … and come back home to a blazing inferno. The entire wooden porch would have ignited quickly, eventually engulfing the house as well. Every single thing we own could be gone. And our sweet little dogs? Can’t even go there. This is what a nuked fern looks like. So you can imagine how immensely grateful we are to Papa God for His mercy and care. I found a new verse I’ve added to my Life Saver scriptures: “Because he is at my right hand, I will not be shaken” (Acts 2:25, NIV). Stirred, yes. Shaken, no. Papa’s got our backs. Now I’ve just got to figure out how to get the smoke odor out of my sweaters hanging in the closet nearest the porch. I’d really rather not walk around this winter reeking of charred faux fern and molten fiberglass. Ideas, anyone?